Services Comparison Checklist -- A handy printable table of evaluation criteria to take to vendor presentations and management meetings. Here's one specific to California's AB 434. Why Accessible? -- The benefits to you to make your website and PDF documents accessible to the blind and the visually impaired. Producing an accessibility report -- How Access2online analyzes websites and produces accessibility reports. Cost-Benefit Model for Accessibility Projects -- A free spreadsheet built to model and analyze the costs vs. benefits of a website accessibility project. Section 508 -- A leading federal accessibility regulation. WCAG 2.1 -- Similar to Section 508, this private-sector accessibility guideline is also sometimes used by the government's enforcement folks. Work and Programs Component-- Oregon's Department of Corrections presents their thoughts on programs like Access2online. Why we engage prison inmates? 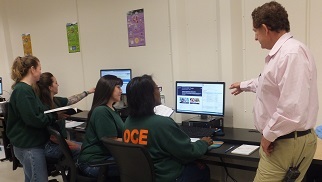 -- Why Access2online provides job opportunities to prison inmates, and why it can matter to you. eTaskBoard for inmates -- How we use the eTaskBoard software to be so efficient, which makes our services so inexpensive. Minitrusts -- Our initiative to develop a financial tool to help parolees. Terms & Conditions -- Before we can do business, we will ask you to agree to these sales terms and conditions.